﻿ Seven Suns Residence, Chiang Mai | FROM $53 - SAVE ON AGODA! "Room was very clean, spacious, great AC, good size bathroom..."
Have a question for Seven Suns Residence? "Our experience with Seven Suns Residence was as close to perfect as we could expect." "Nice, big room, good bed, good breakfast, warm welcome." "The location was good for walking to all sites in the old city, and a few short blocks from some of the main roads." 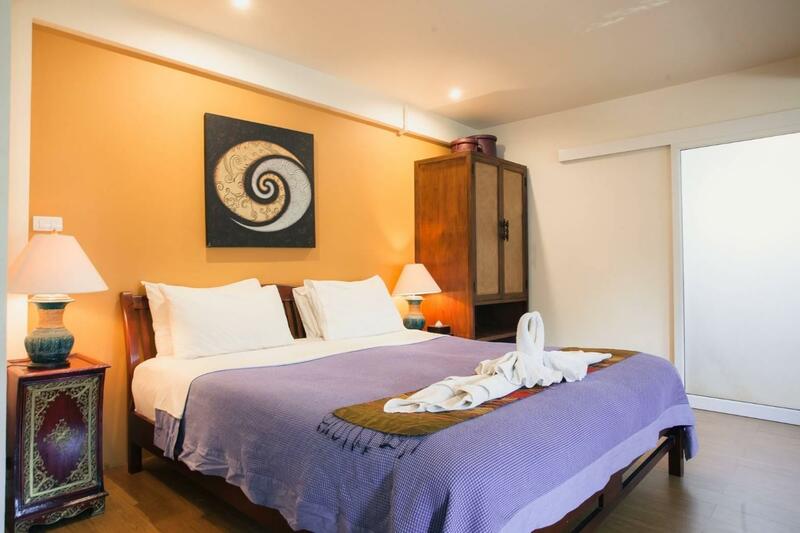 "The owner is really nice"
Book a stay at the Seven Suns Residence in Chiang Mai for a memorable vacation. The rooms here overlook the city, so you can look out at the bustling city roads. The property is near Phajao Mengrai Temple, Thai Dessert, Baan Thai Cookery School, Wat Phra Chao Mengrai Temple, and Srigurd Temple. With a bar, restaurants on the property, a coffee shop, and room service, it features a variety of dining and snacking choices. It has numerous convenient features, such as a library, safety deposit boxes, and a smoking area. Offering guided tours, the Seven Suns Residence is a great spot to stay to learn about the area and see everything you can while you're here. It has four floors and seven bedrooms. The Seven Suns Residence has air conditioning, so you'll have everything you need for a comfortable stay. From daily housekeeping to luggage storage, the Seven Suns Residence has a number of useful services for you to utilize. There's free Wi-Fi available in all rooms, as well as Wi-Fi in common areas, ensuring that visitors are able to contact their friends and family without splashing out on foreign data charges. Chiang Mai Railway Station is 3.5 km away. The nearest airports are Chiang Mai International Airport (CNX) and Lampang Airport (LPT), which are 2.8 km and 79.1 km away. This property offers check-in from 07:30 AM until 09:00 PM and check-out from 07:00 AM until 12:00 PM. "Beautiful, huge room, comfy bed, yummy food at their restaur..."
The property does not have a 24-hour reception. Guests are required to inform the property in advance of their estimated time of arrival. Room was very clean, spacious, great AC, good size bathroom and shower. Only issue was the bed was very hard. I put the cushions from the couches under the sheets for more padding and that helped some. Also the downstairs was always closed early so we didn't really get to interact much with any staff. There are tons of places to eat around it though and book excursions so it wasn't too bad. Oh they did give us clean towels and big water bottles on our third day there so that was a huge plus! Definitely book if you don't mind a hard bed. We travel to Chiang Mai every month and have stayed at Seven Suns on every trip for the last three years. Since the change of ownership last November things continue to get worse. This trip our room was cleaned and serviced only 1 of 3 days. We were told the maids did not come to work so our room could not be cleaned. The breakfast did not open at 7:30 as indicated. Probably won’t stay here again. We stayed at the Seven Suns in a "Luxury Junior Double Bed" for 5 nights in February. The room was like a suite with a sitting area, small table & chairs, counter with small fridge & coffee amenities, large bathroom with separate tiled shower, and a large wardrobe in the bed area. The location was good for walking to all sites in the old city, and a few short blocks from some of the main roads. The restaurant was very reasonably priced and we enjoyed a meal or two there in addition to breakfast each morning. The wifi was good, the AC worked great, and the staff were helpful. The only downside we found was that our room was on the third floor and after a long day of sightseeing & walking it was a bit of a chore to climb all the steps. This was our first time in Chiang Mai and we loved the location. It is very easy to walk to various temples and markets. The staff were wonderful and we really enjoyed the food at the restaurant. We look forward to staying there again. Stayed here a couple of times - good location. However there has been a change of ownership and the organisation is starting to suffer. Chose the Luxury Suite and wasn't disappointed. Spacious room with a large clean bathroom, comfy sofa, writing desk and small kitchen area. There was a slight mix up with our booking initially but this was quickly solved by the friendly staff. Good breakfast and good location. Would definitely recommend this place. Great guesthouse. Would stay here again in a heartbeat. Good sized room, clean and comfortable. AC works well. Owner and his family are wonderful and helpful. On a quiet street and walkable to night markets and all the avtion. Beautiful, huge room, comfy bed, yummy food at their restaurant, owners made us feel at home. Our experience with Seven Suns Residence was as close to perfect as we could expect. The room had (almost) everything we needed and the staff was very willing to ensure this was the case. The only things we found issue with was the Wi-Fi was occasionally not working, and my wife had wished there was a hair dryer but it wasn't much of an issue. Being located in the Old City, the one-way streets make it a little difficult to navigate, but that is to be expected. There is no private parking, but they let us park the motorbike inside the building entrance at night for peace of mind. Owners are very friendly and helpful. We will definitely stay here next time we're in Chiang Mai. Seven Suns was a great value. The room was very large, clean, and well furnished. We were given 1 large bottle and 2 small bottles of water each day. The staff was incredibly helpful and always smiling. The location was in Old Town and easy walk to Wat Chedi Lueng and several other famous temples. Close to Saturday and Sunday Walking Markets. Highly recommended! I really enjoyed Seven Suns Residence. The staff is friendly, location very convenient, and rooms are spacious. I'd definitely recommend to family or friends to stay here. 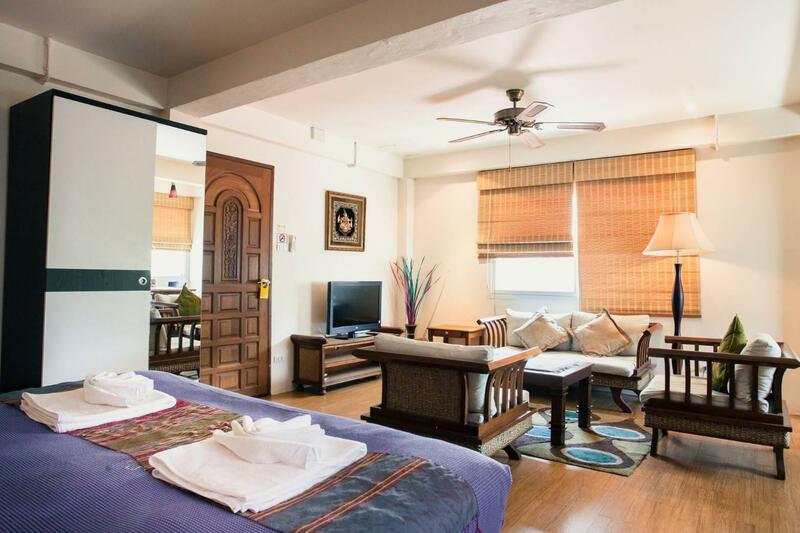 We travel to Chiang Mai nearly every month and alway choose to stay at Seven Suns. The owner and staff are the most friendly and helpful we have ever met. Located in the city walls. Near to local attractions and restaurants. Friendly staff. Good breakfast included. The bar/restaurant was not open often however this was because of the time of year and wasn't a problem. Lovely clean room. Laundry service. Lester the owner and his staff were terrific. 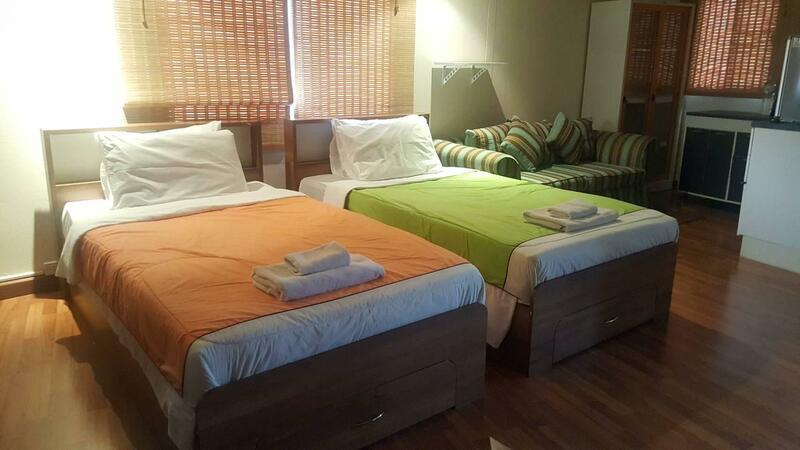 The room was very spacious and well furnished with a large bathroom with separate shower and very clean. The food was excellent and reasonably priced. It is a no frills (no pool no elevator) place that is otherwise superb except internet service that is hit or miss. Had a very nice stay at Seven Suns. The owners Lester & Sun were very good hosts. The staff went over and above to make our stay comfortable. I live and work in Bangkok and this was my first trip to Chang Mai. I was happy in almost every regard with my stay at Seven Suns. Lester and his fantastic wife Sun were warn and thoughtful hosts. The room was well appointed and very large and the breakfasts offered Thai and Western selections. We loved Chang Mai. The pizza at Dukes reminded me of my favorite pizza place in Florida. The live music at Boy Blues Bar was as good as I have heard anywhere. We found that the prices in the night market were at least 30% less than in Bangkok. Chang Mai is blessed with many spectacular temples and we visited many. We defiantly will go back to Chang Mai soon and will stay at Seven Suns again. Huge room with separate dining and sitting area. Enjoyed the coffee press in the morning and relaxing in the evening after a day of sightseeing.